Описание: Нидерландская радиостанция Radio 538 довольно активно выпускает диски по страницам своих хит-листингов. Достаточно полно представлены эти хиты и на нашем трекере. Один из последних сборников по традиции собрал все самое интересное за 2014 год. TITLE "538 Dance Smash Hits Of The Year 2014 (CD1)"
PERFORMER "Lilly Wood & The Prick and Robin Schulz"
PERFORMER "Calvin Harris feat. John Newman"
TITLE "Waves (Robin Schulz Radio Edit)"
PERFORMER "Afrojack & D-Wayne feat. Jack McManus"
PERFORMER "Mike Mago & Dragonette"
PERFORMER "Sander van Doorn, Martin Garrix, DVBBS feat. Aleesia"
PERFORMER "Ariana Grande feat. Zedd"
PERFORMER "Hardwell feat. Chris Jones"
PERFORMER "Chocolate Puma feat. Kris Kiss"
PERFORMER "The Magician feat. Years & Years"
TITLE "We Like To Party"
TITLE "Stolen Dance (FlicFlac Mix)"
TITLE "Backlash (Martin Garrix Edit)"
TITLE "Tremor (Sensation 2014 Anthem)"
PERFORMER "Dimitri Vegas, Martin Garrix, Like Mike"
TITLE "Eat Sleep Rave Repeat (Calvin Harris Radio Edit)"
PERFORMER "Fatboy Slim feat. 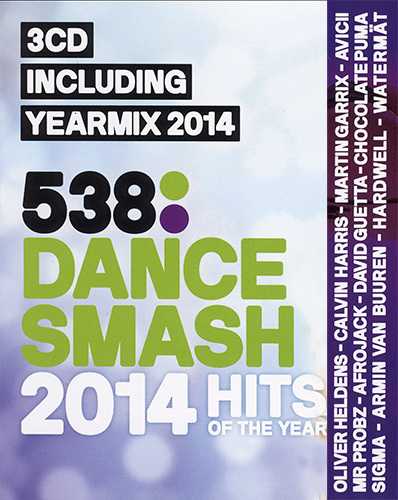 Riva Starr"
TITLE "538 Dance Smash Hits Of The Year 2014 (CD2)"
TITLE "Lovers On The Sun"
PERFORMER "David Guetta feat. Sam Martin"
TITLE "Rather Be (The Magician Remix)"
PERFORMER "Clean Bandit feat. Jess Glynne"
PERFORMER "R3hab & Trevor Guthrie"
TITLE "Virus (How About Now)"
PERFORMER "Martin Garrix & MOTi"
TITLE "Feet On The Ground"
PERFORMER "Nicky Romero & Anouk"
TITLE "Do Or Die (Remix)"
PERFORMER "Afrojack vs. 30 Seconds To Mars"
PERFORMER "Faul & Wad Ad vs. Pnau"
TITLE "Come On Surrender (Nom De Strip & Chris Lake Radio Edit)"
PERFORMER "Sigma feat. Paloma Faith"
TITLE "Bazooka (538 Turn Up The Beach 2014 Theme)"
PERFORMER "Tube & Berger feat. Juliet Sikora"
PERFORMER "Afrojack feat. Snoop Dogg"
PERFORMER "Duke Dumont feat. Jax Jones"
TITLE "Can't Stop Playing (Oliver Heldens & Gregor Salto Remix Edit)"
PERFORMER "Dr. Kucho! & Gregor Salto"
TITLE "Turn Down For What"
PERFORMER " DJ Snake & Lil Jon"
PERFORMER "Martin Garrix & Jay Hardway"
PERFORMER "Steve Aoki, Chris Lake & Tujamo"
TITLE "538 Dance Smash Yearmix 2014 By Jan Hinke"
TITLE "Bazooka (538 Turn Up The Beach 2014 Anthem)"
TITLE "Come On Surreder (Chris Lake & Nom De Strip Radio Edit)"
TITLE "Eat Sleep Rave Repeat (Calvin Harris Remix)"
TITLE "Prayer In C (Robin Schulz Remix)"
PERFORMER "Hardwell feat. Niles Mason"
PERFORMER "Dimitri Vegas & Like Mike feat. Martin Garrix"
TITLE "Stolen Dance (Flic Flac Remix)"
TITLE "Can't Stop Playing (Oliver Heldens Remix)"
PERFORMER "Dr. Kucho! & Gregor Salto "